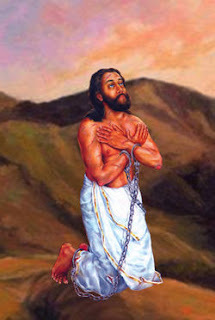 Martyr Devasahayam Pillai of Kanniyakumari District was beatified at a solemn ceremony held at the Carmel School grounds near Ramanputhoor in Nagercoil, Kanniyakumari District in Tamil Nadu(Kottar Diocese). The Chairman of the Congregation for the Causes of Saints, Angelo Cardinal Amato, participated in the function as the Papal Delegate and presided over. Though the initiative for canonization of Devasahayam started as early in 1780, it was in 1984 a group of lay people from the Diocese took it up again which was followed up vigorously by the prelates of Kottar Diocese. The Tamil Nadu Bishops' Conference and the CBCI recommended beatification to Vatican. Blessed Devasahayam is the first ever lay person from India to be canonized. It is a moment of pride for all lay people not only in India but all around the world. Fr. S. Servatius, National Chaplain of CCI-India and CCI International Resource Person also played an active part in the campaigns in Kottar Diocese for the canonization. CCI records its deep appreciation for the tireless efforts by the previous Bishops and the present Bishop Peter Remigius, the clergy and the lay people of Kottar Diocese in this process. Let us hope that the canonization of a lay person will encourage the Church in India to recognise the contribution of lay people in building a sustainable Church and give them the due role they deserve. CCI on its part assures its continuous support and contribution in building the Church through its lay apostolic initiatives in the light of its social teachings and Cardijn's methodology of SEE-JUDGE-ACT.